A county in New York has declared a state of emergency after more than 100 people have been diagnosed with measles. 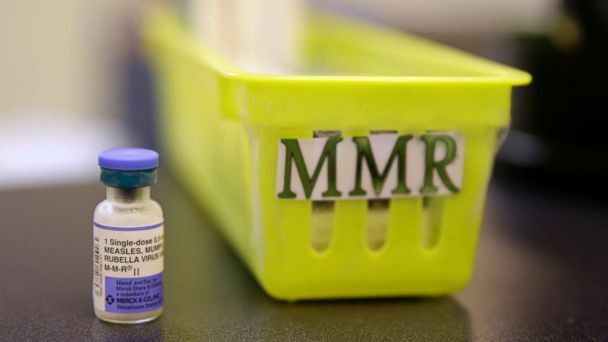 Rockland County officials announced that starting at 12 a.m. on Wednesday, anyone under 18 who has not yet been vaccinated will be barred from public places until they receive the MMR vaccine or until the emergency declaration expires in 30 days. Public places are being defined by county officials as "any place where people get together for civic or social reasons," such as shopping centers, schools and restaurants. Outdoor areas, such as playgrounds, are not included, according to county officials. Law enforcement will not be asking people for vaccination records, but if parents are found to be in violation, their cases will be forwarded to the district attorney, Rockland County Executive Ed Day told reporters in a news conference Tuesday. Violations will be charged as misdemeanors punishable by up to six months in jail and a $500 fine. "We must do everything in our power to end this outbreak," Day said. Those unable to be vaccinated due to confirmed medical reasons are exempt from the declaration, Day said. The Rockland Department of Health will be holding free vaccination clinics all week for residents. Health officials have confirmed 153 reported cases of measles in Rockland County, Day said. Day admonished some residents for not cooperating with health inspectors going door to door to investigate the outbreak. "This type of response is unacceptable, and, frankly, irresponsible," he said. Measles outbreaks in the state of New York began in October and have gone on longer and infected more people than any other current outbreak in the country, according to Kaiser Health News. Through the first week of March, 275 cases had been confirmed statewide, but that number has likely risen since. Much of the measles cases in New York have been concentrated among children of Orthodox Jewish families, many of whom attend religious schools where the vaccination rates are below 95 percent, which is the threshold considered necessary to maintain immunity among the community, known as herd immunity, according to Kaiser Health News. There is "no such thing" as a religious exemption from being immunized, Day said, adding that just 72 percent of the those under 18 in Rockland County are vaccinated. The measles vaccination is 97 percent effective, according to health officials. High-risk groups include pregnant women, children under 6 months and those who are immunocompromised or immunosuppressed. Before the vaccine program began in the 1960s in the U.S., four million people were infected with measles every year, resulting in about 50,000 hospitalizations and 500 deaths annually, according to Kaiser Health News. In 2018, 349 individual cases of measles were confirmed in 26 states, according to the Centers for Disease Control and Prevention. So far in 2019, 314 cases of measles have been confirmed in 15 states. Measles cases have increased in recent years in part because of fears fanned by anti-vaccine activists, according to Kaiser Health News.